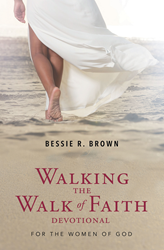 Recent release “Walking the Walk of Faith Devotional: For the Women of God” from Page Publishing author Bessie R. Brown is the inspiration and fortitude to know that faith in The Lord will be everything needed to travel the path of life. Bessie R. Brown, a faith teacher and dedicated writer, has completed her new book “Walking the Walk of Faith Devotional: For the Women of God”: an inspirational and comforting guide with the resounding advice, even when all has failed, God has a plan, give Him a chance. Published by New York City-based Page Publishing, Bessie R. Brown’s reassuring and optimistic view exists to inspire the reader to use their faith to get where they need to be. Even when lost, discouraged, and broken, God knows what everyone is capable of, and where they are. All anyone needs to do is allow Him to lead them safely home. Readers who wish to experience this intriguing and confidence boosting work can purchase“Walking the Walk of Faith Devotional: For the Women of God” at bookstores everywhere, or online at the Apple iTunes store, Amazon, Google Play or Barnes and Noble.